Upynės is a system of rivers and rivulets, endless live fabric, feeding and including the city, its shores, people and thoughts into its nets. 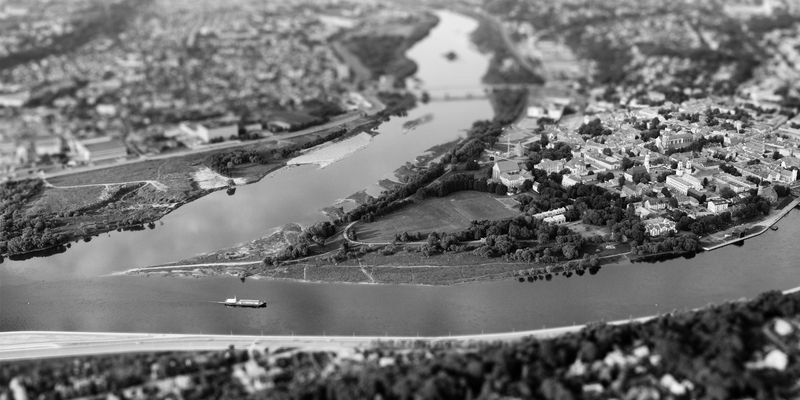 Since ancient times, rivers were integral to the economic and cultural life of Kaunas. Established next to the important water roads in the 15th century, the city started a rapid expansion and soon became one of the most important trade centres of the Grand Duchy of Lithuania. The functional significance of rivers for the city and its surrounding areas increased during the interwar period. Boats carrying loads sailed in Nemunas; there were quite a few industrial enterprises on its shores. During the warm season, riversides were stuffed with Kaunasians enjoying the pleasures of the beach, spending their summers on the beaches around Kaunas: Aukštoji Panemunė, Lampėdžiai, Kačerginė and Kulautuva. After the construction of the Hydroelectric Power Plant at the end of the 1950s, the relationship between the city and the river / the river and the residents of the city changed beyond any point of return. In other words, the social and cultural significance of rivers to the city was lost. Because of this reason, it is no coincidence that the creative activation of the riversides of Kaunas and Kaunas district has become one of the priorities of the programme Kaunas European Capital of Culture 2022, encouraging to initiate changes in local communities and the entire Europe. Since 2017, parts of the project programme are directed at strengthening skills of the communities of various areas, interests and age and rally them, paying attention to the celebration of the local identity and development of the idea of the contemporary city. By 2022, to implement and localise these processes, the communities will be trained in various territories of Kaunas city and its district to act as catalysts to activate the public spaces and riversides. Taking into account long-term (sustainable) river integration strategies, UPYNĖS formulates the vision of the cultural shoreline, i.e.an agglomeration of valuable cultural and social elements. UPYNĖS unites various organisations and independent initiatives (TẽKA, Memory Office, etc. ), representatives from the fields of culture and art who carry out their activities among rivers, rivulets and riversides: Viltė Migonytė-Petrulienė, Augustina Kinderytė, Justinas Kalinauskas, Rasa Chmieliauskaitė, Gediminas Kasparavičius, Daiva Citvarienė, Paulius Tautvydas Laurinaitis, Irutė Tumaitė, Žilvinas Rinkšelis, Evelina Šimkutė and others. In UPYNĖS, we discuss river activation as well as plan research and creative activities that include and connect various stakeholders and audiences (school children, community activists, specialists from various fields of culture) for the activation of riversides among local communities and for the purposes of sustainable tourism, as well as by preparing an open digital map for these activities. Execution of cultural processes in the riverside in the city and the district. Interactive database for water roads, artefacts and events that took place near the rivers. Buildings, constructions, engineering objects, and objects in the water and near it: piers, bridges, wharfs, channels, heritage objects and what remains of them. Natural objects in the rivers and on the riversides: shores, banks, islands, thresholds, shoals, mouths, river flora, etc. Historical, archival information, historical photos of residents. Events, current affairs, community initiatives, cultural processes related to the riverside and rivers and their archives.